This lively scene depicts a group of swells carousing in the street outside the Theatre Royal in Covent Garden after an exceptionally good dinner. The playbills list upcoming entertainment and give us an indication of what's occurring in the street: The Road to Ruin, Blue Devils and Fortune's Frolics. The titles mimic the fortunes of our young bucks as they attempt to make their way home. 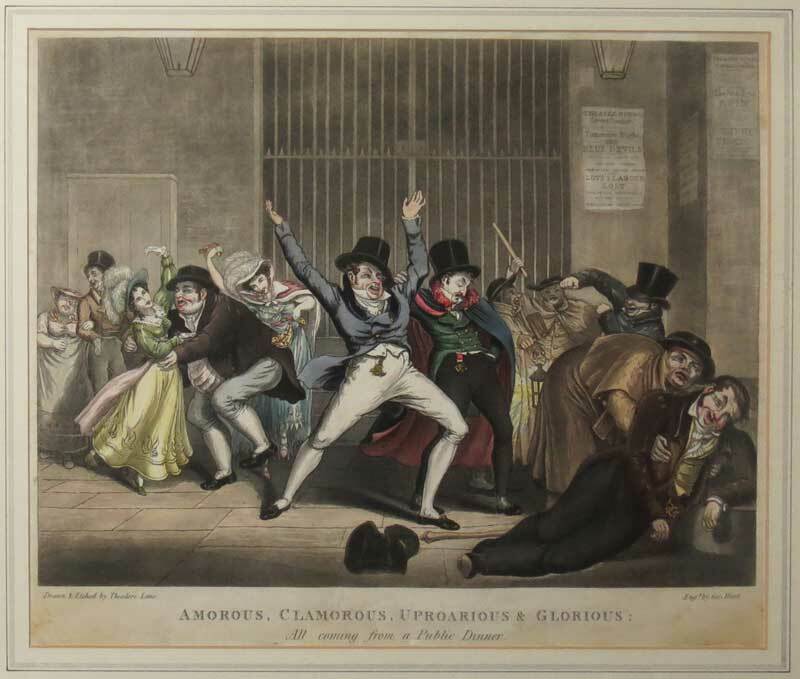 One gentlemen finds himself incapable of standing up, another has been drawn into a brawl with the night watchmen and a third is being unceremoniously pick-pocketed whilst he dances with a harlot. The two main characters meanwhile stride forth, swaggering through the scene.